At Yahoo! Japan our aim is to provide services that satisfy every party involved with us, including Internet users, advertisers, and partner sites. In order to achieve this, we have been undertaking a number of procedures that improve the quality and the transparency of our service. This is an area in which large amounts of specialist knowledge are vital. Yahoo! Japan is constantly reviewing the complex systems in order to sufficiently deal with the large number of ads that are submitted to us. Making full use of technology, we work every day to enhance our systems still further. In order to satisfy the needs both of the advertisers and the Internet users, we place emphasis on assessment by human. Trained personnel, who have deep knowledge of our original guidelines, uses actual computers to conduct reviews. Unlike the mechanical judgments made by machines, human reviewers always assess ads from a users' standpoint. By combining Systematic review and Human review, we aim to display beneficial ads rapidly that match for Internet user intend. Yahoo! Japan offers a wide variety of advertising services to fulfill the objectives of advertisers. 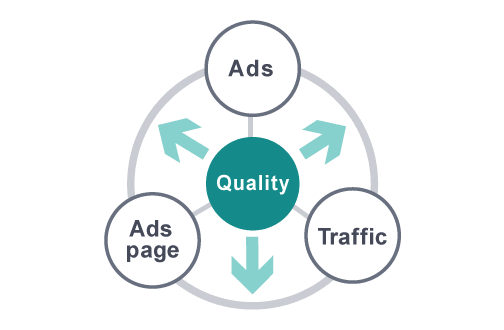 We consider the three prerequisites (given below) are important factor to distribute high quality and appropriate ads within a reasonable time frame. We make use of own technology, knowledge, and experience to review ads and ads pages, to eliminate unauthorized access, to protect privacy, and so forth. We believe that it is vital to display ads that are useful for Internet users, for the sake both of advertisers and the Internet users themselves. We also constantly conduct checks to ensure that ads do not contain false claims or inappropriate content, and are not for products or services that are incompatible with public order and morals. In order for ad reviews to be both accurate and fast, we have consolidated our “Advertisement Editorial Guidelines” and have built a review system based upon them. Yahoo! Japan’s Advertisement Editorial Guidelines have been consolidated so that Internet users can obtain high quality information, and, at the same time, that advertisers are able to acquire a greater number of prospective customers. Advertisement Editorial Guidelines mainly consist of rules related to the content of ads and the expressions used in them, and are designed to ensure that the information displayed is reliable. The rules related to the relevancy of keywords, expressions and pictures used in the ad, and the content of the linked site, are intended to prevent a decline in usability and increase the value of the advertising. The rules have been formulated with a consideration of the individual features of each product, and the details differ depending on the device on which an ad will be displayed. However, the common theme throughout our guidelines is the desire to prevent anything that might be detrimental to Internet users. The guidelines are subject to ongoing revision, being periodically reviewed to keep up with changes in the social environment. In order to ensure that the information provided to Internet users is safe and reliable, Yahoo! Japan carries out checks on advertisers who wish to have ads displayed. This includes a check for any past irregularities associated with them. We also review the ad that they wish to display, checking to see whether the site it links to operates normally, whether contact information is displayed for the user, and whether the content contravenes any relevant laws or standards of public order and decency. Further, we check that elements essential in appropriately linking advertisers to Internet users, (bid keywords, titles, descriptions, images, videos, the products and services offered by the websites) are relevant. If, as a result of the investigation, the content is deemed to be inappropriate, we will decline to display the ad. It is important for ads to be reviewed not just once, but on an ongoing basis. For example, even if an ad satisfies the Advertisement Editorial Guidelines at the time it was submitted, it is possible that the content of the site, or the ad itself might be changed at a later date. Review of ads continue after the ads are approved due to the potential for situations that are detrimental or disadvantageous to Internet users, such as ads that include falsehoods or exaggerations, ads that contravene relevant laws or standards of public order and decency, or ads that use features of the Internet for dishonest ends. In order to protect Internet users and improve the usefulness of our services to them, we undertake the review work detailed below. With the aim of protecting Internet users, Yahoo! Japan operates “patrols”, focusing on ads that we suspect of potentially violating relevant laws. These patrols allow us to maintain the quality of ads by checking for things like deliberate changes in ads (titles, descriptions, images, videos, etc.) or site content, as well as checking the use of keywords related to topical events. This kind of review is normally undertaken in response to user complaints. After reviewing these ads with reference to a number of different criteria, we make the decision as to whether there is a problem. In addition to conducting reviews of ad content, we also undertake the following measures to prevent unauthorized activity. These measures are designed to act as a counter to the recent proliferation of poor quality ads and advertisers with malign intent. We take measures to prevent the unauthorized use of credit cards by third parties, credit card crime, and so on. We have measures in place to respond to the sale of fake brand goods and sites that copy other companies’ designs in detail. We have measures in place to respond to malware, software created for malign purposes, and sites that we suspect may spread computer viruses. Yahoo! Japan distributes ads through a wide range of services. These services are offered via a large number of partner sites and applications, as well as via Yahoo! Japan itself. To ensure that advertisers can connect with Internet users, and display ads with confidence, in addition to vetting our partners prior to displaying ads, we also undertake quality management of ad distribution, including checking the partner sites before and after ad distribution commences. We are also undertaking to confirm that ads have actually been distributed. Yahoo! Japan’s original guidelines determine whether a site can become a partner and display ads. When selecting partners, we conduct a review based upon these internal guidelines. The partners who participate in Yahoo! JAPAN's ad distribution network cover a wide range of different types and sizes, extending from small specialist sites to mega-sites with more than a billion PVs (page views) per month. Before we start placing ads on sites, we review them based on our guidelines. This involves assessing sites on a range of points including the theme and content of the site, and checking whether it is a suitable partner for ad distribution. This review is conducted by highly trained staff and we do not start displaying ads on sites until they have been approved by this review. The guidelines focus mainly on the following types of sites and checking the quality of each of our partners to ensure that they do not violate relevant laws, public order, or morals. Are the system settings correct? Is the site configured to display ads in the required manner? Do ads display correctly without any errors? Even after ads begin to be distributed, Yahoo! 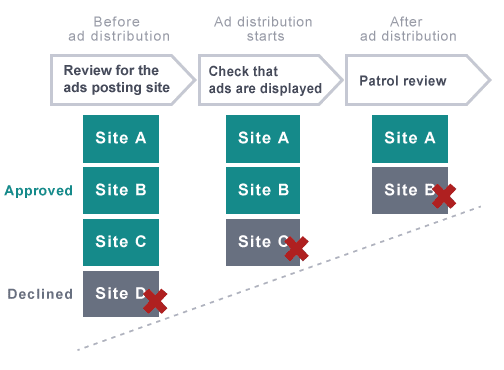 JAPAN continues to control the quality of ad distribution by checking the content of partner sites, confirming the correct distribution of ads, and performing regular monitoring of the entire ad distribution network. Further, in addition to the above, our specialists regularly conduct patrols of partner sites, forming a general view that takes into consideration such factors as whether the settings are in line with the rules, and the opinions of Internet users. If it is judged that the site does not reach the required level, and that there is no sign of the quality improving, action is taken, possibly including the suspension of ad distribution. With the aim of protecting advertisers, we conduct patrols that focus on whether the site displaying ads follows our guidelines. These patrol reviews ensure that the quality of the sites displaying ads is maintained. This form of review is primarily undertaken as a response to complaints from advertisers. After reviewing the content according to a number of different criteria, we make the decision as to whether there is a problem with the place or means of ad distribution. The term “traffic” refers to Internet users accessing an ad. The more effective an ad is and the higher the access to it, the better the quality of the traffic. At Yahoo! Japan, we manage the quality of ad traffic by regularly monitoring the entire ad distribution network. In order to ensure the satisfaction of advertisers and partners, we have been consolidating measures to improve traffic quality. At Yahoo! Japan, we make fairness a primary consideration of our Internet advertising, turning the elements that determine traffic quality, such as the actions of the Internet users who view the ads, or the effectiveness of ads, into a score, and then using this as an index to maintain traffic quality at a certain level. If the score falls below this level, we identify the cause of the decline in traffic quality and then take action to improve it. At Yahoo! Japan, clicks that aren’t related to legitimate visits and purchases from users, mistaken clicks by users, or clicks that are judged to have been motivated by dishonest intentions, are called invalid clicks. For advertising services with click charging, the removal of invalid clicks is an important element in improving traffic quality. Therefore, invalid clicks are not charged for. Our countermeasures against invalid clicks are in continuous operation as part of our effort to improve traffic quality. * The detailed definition and criteria describing invalid clicks is not displayed in order to prevent the malicious use of this information by users. We ask for your understanding in this matter. Our system is designed to exclude clicks that are judged to be invalid or are suspected of being invalid from billing statements so that the advertisers will not be charged for them. Going through the steps detailed below, we search for invalid clicks and protect advertisers from invalid clicks. The invalid click prevention system consists of a complex series of filters that operate 24 hours a day to detect invalid clicks. Yahoo! 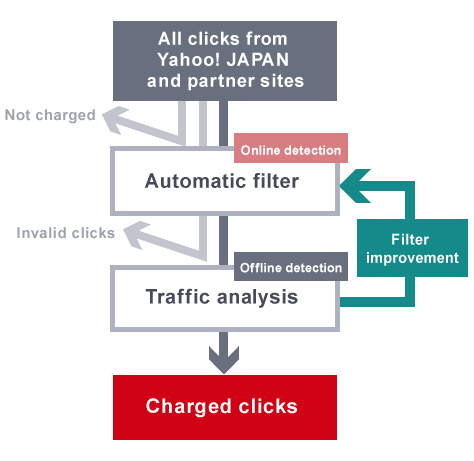 JAPAN monitors invalid clicks by combining a large amount of information such as clicks and searches. Clicks are analyzed by specialists, including clicks that have passed the invalid click prevention system. They look for patterns of clicks that appear to be invalid. If they find any, they update the invalid click prevention system so that advertisers are no longer charged for these clicks. As noted above, in order to remove invalid clicks, we have proactively introduced technology for detecting invalid clicks. This method ensures that clicks that are deemed to be invalid are automatically removed from reports. Further, to protect advertisers, we have many ways of adjusting charges in response to invalid clicks or clicks suspected of being invalid. On the other hand if a site operator or advertiser engages in a violation of the rules by deliberately attempting to generate invalid clicks, whether they be an individual or an organization, we may resort to legal action. Further, we will deal with related accounts in an appropriate manner.